It’s 4:20 p.m. on a Saturday afternoon, and I’m stationed at a long, thin table, sandwiched between a scientist and an attorney. No, this is not the beginning of a dirty joke — it’s the beginning of what turned out to be an educational afternoon. The tables are quite obviously set for a sushi rolling lesson, but with a few crucial variables. The assembled tools include chopsticks, a red plastic lighter, some sliced cucumber, a ripe avocado,rolling papers and a huge, dense nugget of pungent flowering marijuana. I immediately realize I’m not adequately prepared for this writing assignment. A formidable panic sets in. As I turn to survey the rest of the room, there are about 50 men and women of various shapes, sizes and ethnicities. The woman behind me could easily be my grandmother — but she’s smiling at me and clearly has 100 percent more chill than I do at the moment. Maybe I should hit the weed? It’s prescribed for anxiety. 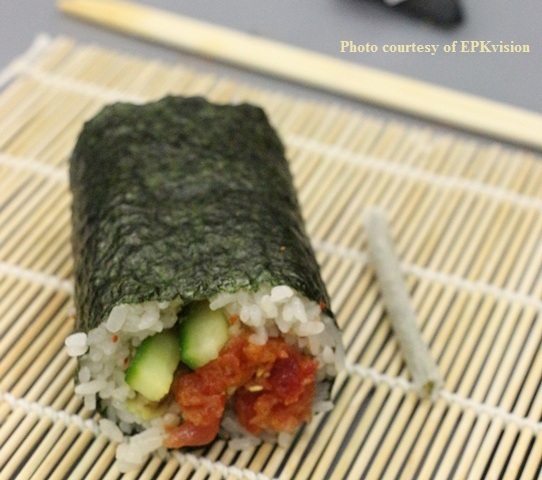 These sushi and doobie rolling classes are the first of their kind in the Harbor Area and are organized by Mary Jane University, a company whose main initiative is bridging the gap between medication and education. Times are changing and many find the new wave of marijuana consumption both intimidating and overwhelming. There are so many products available, including infused creams, honey, tea, chocolate, even gelato. Where does one even begin? The first time I had an edible or a marijuana-infused snack was one of the worst experiences of my life. I was curious, young and incredibly ill-informed, and the high was so intense I wanted to army-crawl out of my skin. I thought I was going to die — and the only cure was three boxes of Kraft Mac & Cheese and a three-hour nap. That was enough to keep me away for more than 15 years and I’m certain I’m not alone. Several friends have confessed that they, too, fell victim to a chocolate brownie that landed them in a downward spiral of debilitating panic. The misguided apprehension with regards to marijuana consumption comes from a lack of knowledge. Most people scoff at this but the truth is that there is scientific evidence supporting the benefits of marijuana consumption. The untapped potential is overwhelming and stuck between political and financial issues. I’m not advocating for its recreational use, but at the end of the day, it’s none of my business what you put in your body. However, the discourse is warranted and an open-mind is necessary. And for the love of Jesus, don’t eat the whole brownie! MJU’s primary focus is to bring the dispensary experience into the home through educational presentations — think Tupperware parties but for weed — and I say that in the most loving way. Just recently, they’ve added the high dining experience to their repertoire — ergo doobies and sushi. The rest of Los Angeles has been holding underground and not-so-underground marijuana-infused dinners for some time now and they’re definitely on to something. The class took several hours and I was entertained and engaged the entire time. Guests wandered around the Goosefire Gallery, a glass blowing facility that also teaches classes and showcases student work. Chef Victor Miller led both the sushi and doobie rolling portion of the class. His crew passed out deliciously crisp, fresh oysters and seared scallops, while we sipped on fresh squeezed blood orange soda. Vendors toting chocolates to infused bath bombs shared products and knowledge. The scientist next to me chimed in. “This is a cultural awakening that needs information,” Jeffrey Raber, an organic chemist who has spent the last ten years of his career studying botanical analysis, said. “Everyone is curious, so we should probably start explaining how this works.” He explained that you can’t put all marijuana strains into the same category. They all work differently according to an individual’s body chemistry. Let me be clear — this was not a whole bunch of people sitting around getting stoned, nor was any of the food infused that evening. In fact, you didn’t have to spark up the doobie. No one was visibly stoned or impaired either. This was purely for fun and education. Admittedly, those who smoked were slightly more inclined to eat the sushi, and the rest of the extra hand rolls, and a couple of the homemade strawberry ice cream sandwiches, and a couple mints from the bathroom. Actually, it was probably closer to nine mints, but who’s counting?